1) HRP Protest Note on SPM Mid term exam question on racially insulting the Indians novel Interlok by Gombak District Education Department. 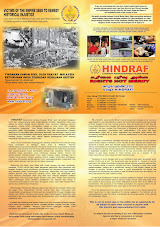 2) Replace Interlok with 25 November 2007 Hindraf Rally novel. Re : 1) HRP Protest Note on SPM Mid term exam question on racially insulting the Indians novel Interlok by Gombak District Education Department. 2) Replace Interlok with 25 November 2007 Hindraf Rally novel. This morning we received a complaint from a parent from Gombak that for the Form five mid term exams held yesterday 9/5/11, for the Malay language paper 2 (1103/2) prepared by the Gombak district Office. Questions were asked on the racially insulting the Indians novel Interlok with the derogatory insulting word “paria” being used. 1. Narrate two interesting happenings in Interlok and why they think so. (This carries 7 marks). 2. Narrate one background of a place (physical setting) in the said Novel. (This carries 8 marks). All exam questions could have easily been based on the alternative novel “Papa” (copy of exam papers are enclosed herewith). We wish to register our protest on this implementation of the racist agenda by at least the BTN Gombak District Education Department in contravention of the Minister of Education’s and the Malaysian Cabinet’s directive not to use the unedited version of Interlok book in schools. Please take note that from the feedback we have received from the public, with the introduction of this Interlok novel there has been a sharp increase of further racial disharmony to the point of even malay muslim students calling Indian students “keling pariah” and the teachers turning a blind eye. In the latest case when questioned one malay muslim student even punched an Indian student Thaneswaran (15) on the face at the SMK Sg Buloh using a buku lima first metal weapon and causing his face to swell (see photo in www.humanrightspartymalaysia.com postings on 1st May 2011. Despite a police report having been lodged, zero action has been taken. Of course had if it had been the other way around the Indian boy would have been sacked from school by now or prosecuted and unable to come up with money for bail and lawyer’s fees and would be languishing in jail today by the Malay-sian standards of Justice. In any event kindly confirm what action has been taken on this case. These instances are just the tip of the iceberg of the ripple effect of this Interlok novel vis a vis racial harmony, national integration national unity and racial and religious co existence in what is otherwise supposed to be One Malaysia. 1. That for this Interlok Novel be forthwith and in any event within 14 days be ordered to be removed from all schools in Malaysia by a clear written directive by the Education Minister. 2. This book be banned as a text book in all schools in Malaysia. 3. As a deterrent, forthwith sack the Director of the Gombak Education Department or at least interdict him forthwith cause a and show cause letter be issued as to why he should not be sacked.